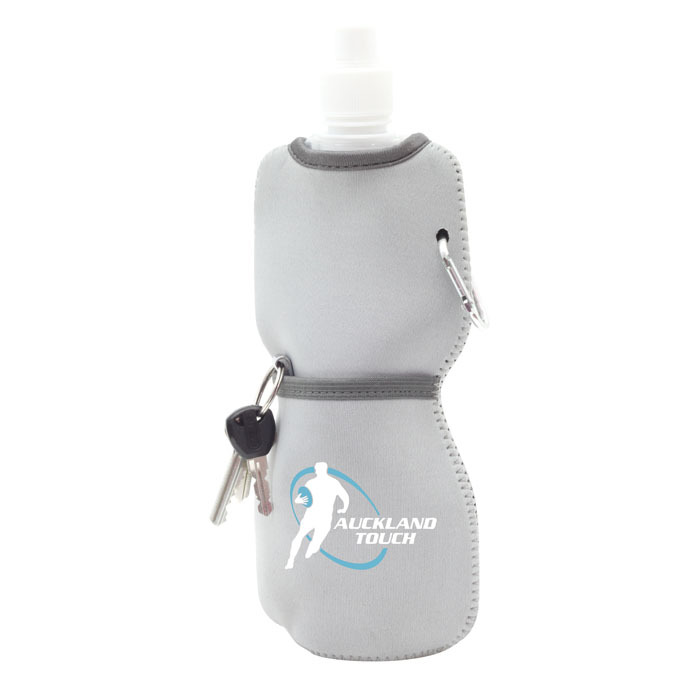 Stock Description: FOLDABLE BOTTLE IN NEOPRENE SLEEVE. Long Description: Insulating neoprene sleeve holds a refillable, reusable 480ml water bottle made from a durable PE plastic, BPA free. These bottles collapse when empty for convenient travel use. The sleeve has a mini carabiner clip and a convenient front pocket to hold key, smart phone or credit cards. Product Colour: Grey. Product Material: Neoprene. Product Size: 120 x 270 x 45mm. Print Size: Print: 70 x 70mm. Print Type: Brand: Screen.